It is amazing how fast 10 days on the Celebrity Millennium went. 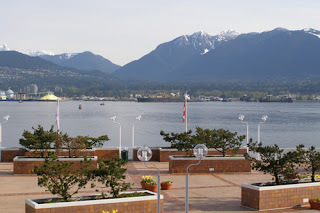 When I look back, I see that I certainly did a lot and visited a lot of places, but the saying is true, “time flies when you are having fun!” It was time for the fun (at least the ship fun) to end as we docked at our final stop – Vancouver. 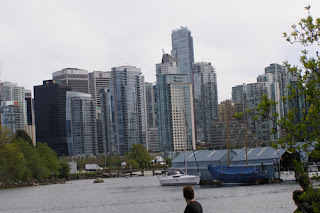 I wasn’t about to let the opportunity to check out this popular city get by, so I arranged with the British Columbia and Vancouver tourism boards for Lynn and I to spend the day and night exploring. 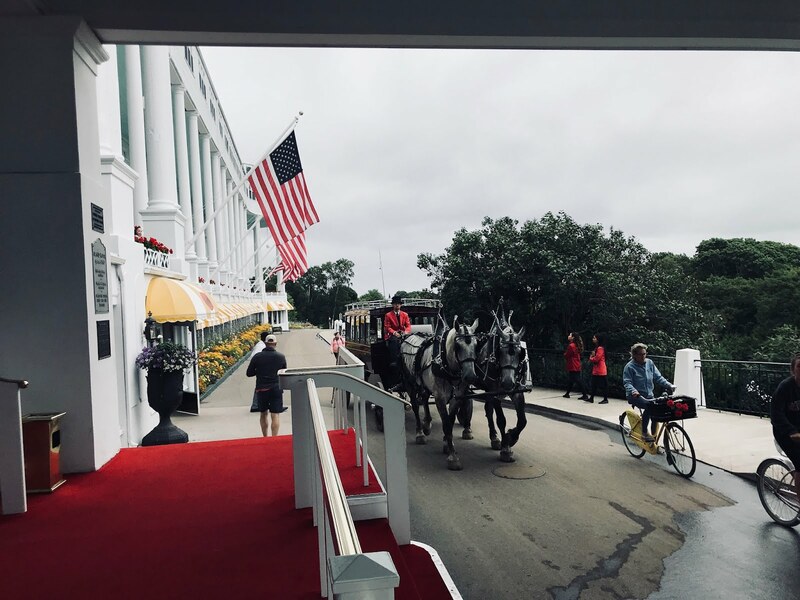 We were also invited to stay at the Wedgewood Hotel & Spa, a beautiful Relais & Chateau property, so we didn’t have to worry about getting to the airport until morning. I could see how people love this city, with its modern décor, great food and wide-ranged culture. For me, it was the combination of the water and snow-capped mountains that would draw me in the most. Josie Heisig of British Columbia Tourism, the woman who had orchestrated my visit to the Okanagan Valley, Victoria and Vancouver, picked us up at the hotel. We went straight to Granville Island where we met our guide at the Pacific Institute of Culinary Arts for the Plugged in Walking Tour. 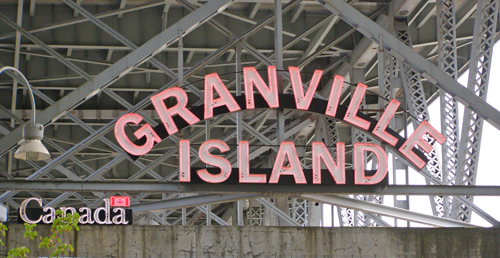 Granville Island is another face of Vancouver, where you can find food from every ethnicity, as well as fresh vegetables, fruits, coffees and cheeses at its huge market. 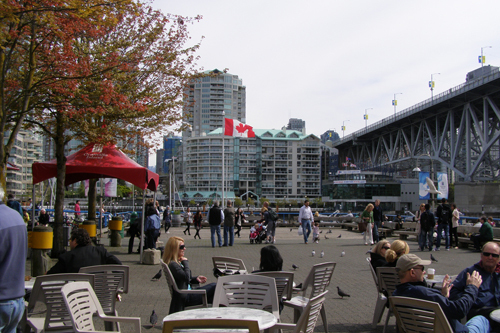 The Granville Market also has a great outdoor patio where you can watch the boats and enjoy some of the food you pick up at the market. The rest of the island is filled with quaint shops, museums and boating activities for the casual vacationer or serious fisherman. Though I can’t eat any fish or seafood, this is certainly the place to find it, as the fisherman bring it right in by boat. There’s also an artsy hangout, the Net Loft, where you can find stores with everything from paintings to arts and crafts supplies. I wish I had more time at Granville Island, but we had so much to see in such a short time. We toasted our goodbye with a light and fruity 2009 Little Straw Sauvignon Blanc and took a cab back to the city. 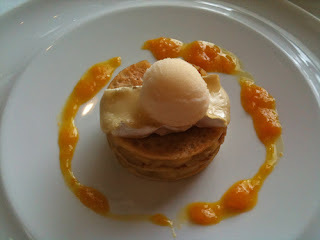 Lunch was at West Restaurant. We were joined by Jorden Hutchison of Tourism Vancouver and Alex Shaw, the restaurant’s PR rep. 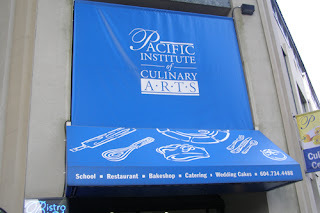 I started with another great British Columbia wine, the 2009 Poplar Grove Pinot Gris while they told me about this restaurant, where Chef David Gunion focuses on fresh, sustainable Canadian cuisine. We started with a yummy Pork Pate with Pistachios before we got the perfect Lamb Risotto, filled with cheese and wild mushrooms, while we nibbled on crispy Truffle Fries. For a main course I ordered the Housemade Merguez Sausage with Chickpeas, Mint and Yogurt, and it was very good. Lynn enjoyed the Stinging Nettle and Ricotta Agnolotti with Fava, Roasted Lemon and parmesan. Although I usually tend to gravitate to the chocolate for dessert, I was intrigued by the Apple Crepes filled with Brie and topped with Ice Cream. 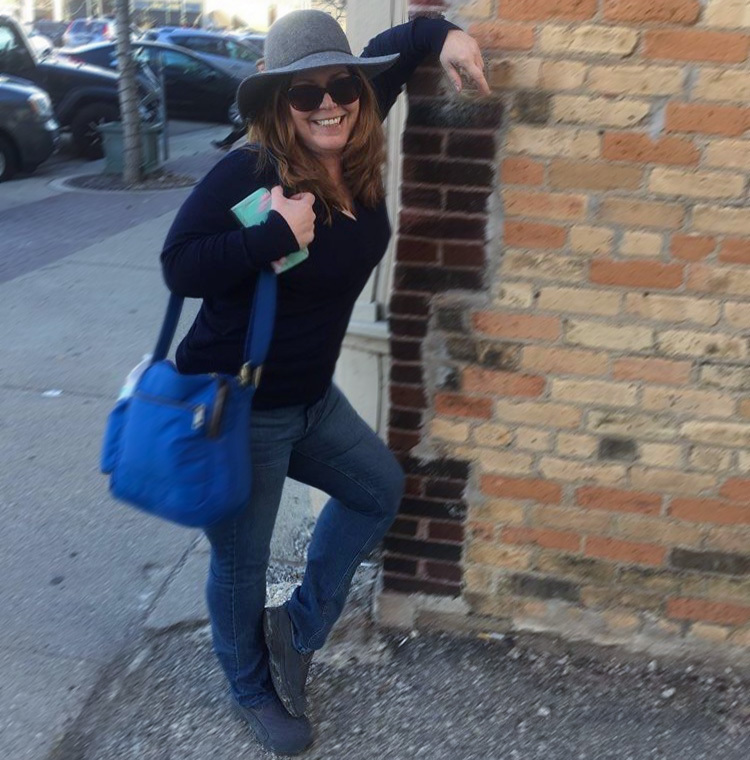 It was definitely a good choice and I knew I was ready for some sightseeing to burn off the calories. It was hard to decide what to do, but we finally chose to go down to Stanley Park. This huge park is worth walking around all day, but since our time was limited we decided to take the Horse Drawn Tour. It was a lot of fun and we learned a lot about this park, which is 157 acres larger than Central Park in New York. We rode along the harbor and passed the Royal Vancouver Yacht Club, Discover Island and the Gate Bridge that Guinness built. We also saw more of the beautiful mountains in the backdrop, still covered with plenty of snow. After the tour, we had some wonderful cocktails at Bacchus Restaurant Lounge in the lobby of the Wedgewood with Joanna Tsaparas-Piche, the hotel’s Director of Sales & Marketing. This is a very popular place and it’s easy to see why. The chairs and tables are cozy and inviting and the drinks are interesting, but not too over the top with crazy (still recovering from last year’s bacon mania) ingredients. I sampled the Insomniac (Van Gogh Espresso Vodka, Gifford Caramel, Bailey’s Irish Cream and a shot of espresso) and the Red Satin Skipper (Vodka, Raspberry Liquor and Cranberry Juice). The drinks here are poured at the table through a shaker, one of the touches that helped it earn the label of Best Bar & Lounge in the City by Vancouver Magazine. 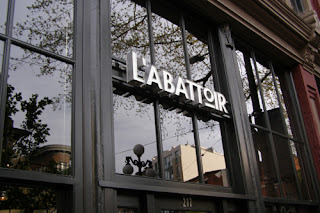 Dinner was at L’Abbattoir in the Gastown district of Vancouver. 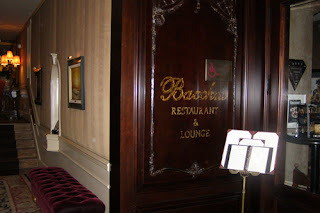 This place has received many accolades recently and it was packed to the brim. Though it currently boasts a very modern décor, L’Abbatoir was actually the first jail in Vancouver. We started at the bar, were the cocktail menu includes their own barrel-aged whisky. I prefer something a bit lighter and the sommelier suggested a 2009 Pentage Gamay Rose from the Okanagan Valley, ideally light and fruity and it worked wonderful with the Bacon Brioche Sesame Flat Breach and Homemade Gnocchi with Poached Eggs and Cheese. I thought my Pork Verde in Milk with Salsa Verde was tender and flavorful (though I felt it could have been served with some carbs to round it out). Lynn had the Steak Diane, which she thought was good. We were both pretty stuffed from a long day (or should I say two weeks!) of eating, but I’m glad we tasted the Warm Chocolate Torte with Vanilla Custard as it was excellent. I knew I had only touched the surface of all Vancouver had to offer, but I had an early flight back home. 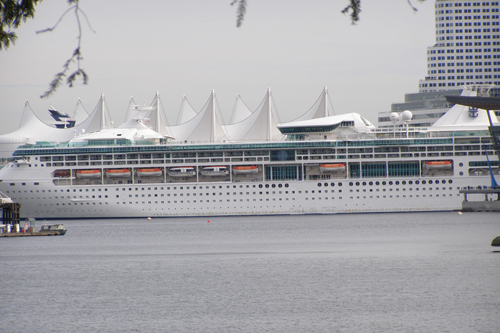 As I went to sleep, the Celebrity Cruise remained docked at Vancouver Metro Port. It was setting sail to Alaska the next day. This ship led me to quite an adventure and I look forward to meeting her (or one of her sisters) again! I will also be counting the days until I return to the Pacific Northwest. Note: There were so many people and places that helped make this trip possible, but I would like to especially thank Celebrity Cruise Line and British Columbia.